The second of two posts on the Bijapur manuscript Javāhir al-mūsīqāt, c.1570/c.1630 by guest blogger Katherine Butler Schofield of King’s College London. This manuscript has now been digitised and is available to read online on British Library Digitised Manuscripts. Follow the links below to go directly to the relevant folios. In my last post, I concluded that Shaikh ‘Abd al-Karim’s musical masterwork, the Javāhir al-Mūsīqāt-i Muḥammadī, is a multilingual palimpsest of three treatises: a translation c. 1570 of the 13th-century Sanskrit Saṅgītaratnākara into 16th-century Dakhni, probably for ‘Ali ‘Adil Shah of Bijapur (r.1558-80), which was split apart and its paintings reused by Shaikh ‘Abd al-Karim to form the central thread of a more elaborate 17th-century Persian translation dedicated to ‘Ali’s great-nephew, Muhammad ‘Adil Shah (r.1626-56). This unique work is culturally significant for several reasons. For one thing, when placed in wider geographical context it testifies to a significant vernacularisation of Sanskrit music theory in the 16th century, preceding by nearly a century its recodification in Persian under the Mughals (see Brown below). A number of other noteworthy vernacular music treatises made their appearance in this century: e.g. a miniature Awadhi verse treatise inserted into Qutban’s Sufi romance the Mṛgāvatī (1503) produced in Jaunpur (Behl, pp. 131-133); a Braj rāgamālā called the Mānakutūhala, traditionally attributed to Raja Man Singh of Gwalior (d.1516). ; and a Marathi translation of the Saṅgītaratnākara with paintings of very similar style and date to the Jawāhir (Zebrowski, pp. 60-4). The production of a substantial Dakhni recension of the Saṅgītaratnākara in Bijapur thus confirms a growing picture of a vernacularising 16th century in north and central India’s independent courts. But a major reason this work is of importance to music and cultural history is Shaikh ‘Abd al-Karim’s systematic integration of ideas from the Islamicate sciences about the power of sound and its effects in human affairs into a work of Indic musicology. We already know from work done on the great astrological treatise written in Persian for ‘Ali ‘Adil Shah, the Nujum al-‘ulūm (1570) – whose paintings are used to date the Jawāhir’s – that ‘Ali ‘Adil Shah, and later Ibrahim ʻAdil Shah II (r.1580-1626), freely mixed Hindu and Muslim symbology and theories of supernatural power, including those associated with music, and incorporated them into their courtly ideologies (see Flatt; Leach, v.2, pp. 819-89; Hutton, pp. 51-2 and fig. 2.14; Zebrowski, pp. 60-4). Although Muhammad ʻAdil Shah is sometimes characterised as more narrowly orthodox, this generous attitude remains primary in Shaikh ‘Abd al-Karim’s vision. Strikingly, with respect to music’s origin myths and explanations of its power to regulate the universe, he treats the philosophies of “ ‘Arabia, ‘Ajam and Hind” as effectively equal in truth value (f. 5v). More important, though, is his systematic appropriation of the Indian rāgas into the Greco-Islamicate system of humoral medicine known as Unani ṭibb. Every rāga and rāginī in the Indic system is supposed to have a specific effect on the listener’s psychological state, their physical wellbeing, or indeed on the wider natural world. Rāginī Dhanashri, for example, is supposed to evoke feelings of loss and longing caused by the absent beloved. Rāg Megh, one of the six main rāgas, has the power to bring the monsoon rains; the coming of the rains is furthermore associated with the joy of union with the beloved. In Shaikh ‘Abd al-Karim’s rāgamālā he systematically attributes the essential emotional flavour of every rāga to one of the four elements of Islamicate natural sciences – fire, earth, air and water. He furthermore describes the effect of each of the four kinds of rāga on the physical and mental state of the listener in terms borrowed from Sufi teaching and ethical literature (akhlāq): fiery rāgas ignite passionate love (‘ishq) in the listener’s heart; earthy rāgas enlighten the listener with the mystical knowledge (‘irfān) of their true selves; airy rāgas overwhelm the listener with longing for the absent beloved (firāq); and watery rāgas annhilate the listener in union (viṣal) with the great Existence (ff. 66v-8r). The iconography of rāgamālā paintings is supposed to intensify and enrich the rāgas’ affective associations using visual and imaginative rather than aural means. The c.1570 rāgamālā paintings of the Javāhir belong to a time when rāga-rāginī sets were clearly not yet standardised. Although it uses the same six rāgas as the contemporaneous “Painters system” – Bhairav, Hindol, Megh, Malkausik, Shri and Dipak – I have not before encountered its particular configuration of rāginīs. In addition, the classic iconography we are accustomed to was clearly not yet settled. Some rāgas had already acquired their standard form. Rag Megh, for example, is of course watery in essence, and listening to it engenders loving union; singing this rāga may cause clouds to gather in the heavens or rain to fall, powerful lightening to strike and frogs to start croaking. In the rāgamālā text and painting Megh is depicted as a dark-skinned lord dressed in green and riding a black buck, with the monsoon rainclouds gathering above his head and two pied cuckoos in the background. Ragini Dhanashri, on the other hand, is not depicted in her now customary form: a woman consumed with longing, gazing at a portrait of her absent beloved as she is consoled by her girlfriends. The mood of viraha or firāq is nonetheless sustained in the Javāhir pictorially by Dhanashri’s loose dishevelled hair, her chin resting disconsolately on her hand as she sits on a bed waiting for her lover’s return. And Shaikh ‘Abd al-Karim makes it explicit in the Persian text: Dhanashri is an airy rāginī, and thus listening to her overwhelms the listener with longing (ff. 99r-100r). In this way the rāgas and their rich aesthetic and affective powers are here recruited to the service of Sufi devotion and appropriated as medicinal and supernatural formulae, thus giving excellent grounds for a Muslim ruler like Muhammad ‘Adil Shah to use the rāgas in regulating and maintaining order in the body politic. It is important to note that the elemental associations of the Javāhir rāga descriptions are not in the Dakhni text. Their relation to the paintings is thus an early- to mid- 17th-century interpretation, undertaken in a more Persianate universe. I thus want to speculate in conclusion about the impact this text, and perhaps other Bijapuri treatises like it, now lost, had on the Mughal recodification of śastric music theory in Persian during the reign of the Mughal emperor Aurangzeb ‘Alamgir (1658-1707) (see Schofield below). The evidence is circumstantial, but cumulative and therefore tantalising. From the first brief Mughal formulation of saṅgītaśāstra in Persian, Abuʼl-Fazl’s chapter on saṅgīt in the Ā’īn-i Akbarī (1593), Mughal music theorists all venerated the south and especially the Deccan as the arbiter of authority in Indian music. Political and cultural emissaries were sent regularly between the Mughal and Bijapur courts from the time of ‘Ali ‘Adil Shah, and in the first decades of the 17th century the two powers came into direct conflict, and then more peaceful accommodation, over the collapse of the Nizam Shahi state of Ahmadnagar. Akbar and Jahangir certainly knew of Ibrahim ‘Adil Shah’s musical prowess; Jahangir even made note of Ibrahim’s famous song collection, the Kitāb-i nauras, in his memoir, and welcomed one of his musicians to the Mughal court. And Ibrahim in turn was fascinated by Akbar’s great musician Tansen and the quality of Akbar’s relationship with him. What, then, of Muhammad ‘Adil Shah and his connections with his exact Mughal contemporary Shah Jahan (r.1628-58) and his Deccan viceroy Aurangzeb, the future emperor ‘Alamgir? 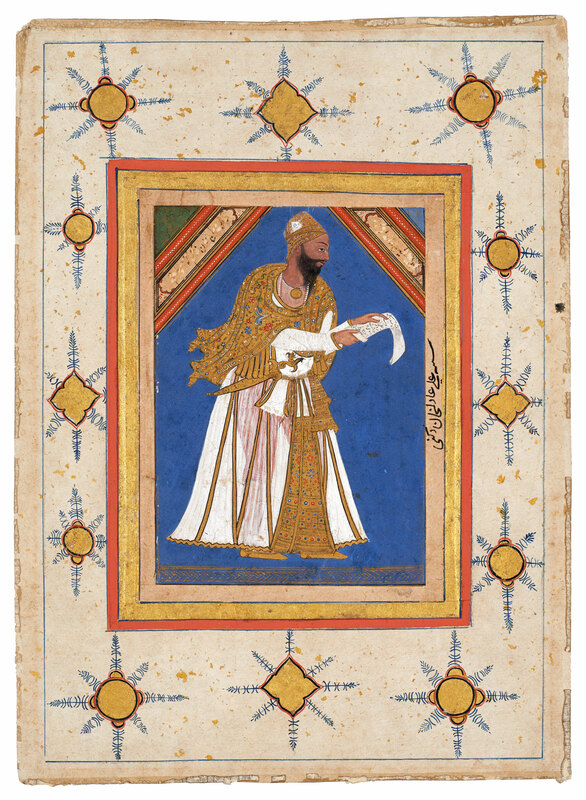 Shaikh ‘Abd al-Karim portrays Muhammad ‘Adil Shah as a great lover and connoisseur of music – and to my knowledge, the Javāhir is the earliest extant full-scale Persian work of Indian musicology from the Mughal period. Why write it in Persian not Dakhni? We know that the miniature paintings of Muhammad ‘Adil Shah’s reign draw to an unprecedented extent on Mughal inspiration, which included importing Mughal artists. Did Shaikh ‘Abd al-Karim’s choice to write a great treatise in Persian similarly reflect his patron’s aspirations to Mughal recognition, in a subject in which Bijapur was already renowned as the authority? Conversely, what impact did the Javāhir’s unapologetic mixing of Indic musical science with Islamicate natural and esoteric sciences and mystical and ethical teaching have on the explosion of music theory in Persian at ‘Alamgir’s court in the 1660s and 70s? It is suggestive that the first full-scale Indian music treatise in Persian for a Mughal emperor – Qazi Hasan’s Miftāḥ al-surūd (1663-4) – was written in Daulatabad for ‘Alamgir, and has many similar features. More importantly, the humoral explanation of the rāgās’ potency is fundamental to several treatises written at ‘Alamgir’s court itself. We do not have the evidence to say definitively that Mughal connoisseurs and intellectuals were inspired to translate Indian music theory into Persian by what they saw coming out of Bijapur. What we can say is that the Javāhir al-mūsiqāt-i Muḥammadī is a precious landmark in Indian musicology: the earliest known musicological work in Dakhni, and the earliest full-scale Persian work on Indian music from the Mughal period still extant. Yet it is just one of hundreds of Indian musical treasures held today in the British Library’s collections. K B Brown [Schofield], “Hindustani music in the time of Aurangzeb,” unpublished PhD thesis (SOAS, 2003). A Behl, The Magic Doe, W Doniger, ed. (Oxford, 2012). M Zebrowski, Deccani painting (London, 1983). E J Flatt, “The authorship and significance of the Nujūm al-‘ulūm,” JAOS 131.2 (2011), pp. 223-44. L Y Leach, Mughal and other Indian paintings from the Chester Beatty Library (London, 1995). D Hutton, Art of the court of Bijapur (Oxford, 2011). J P Losty, “Early Bijapuri musical paintings”, in An Age of Splendour, Islamic Art in India, ed. K. Khandalavala (Bombay, 1983), pp. 128-31. With thanks to the European Research Council; and to Molly E Aitken, Yael Rice and Margaret E Walker for art-historical, codicological and dance-historical advice. Any errors are mine.